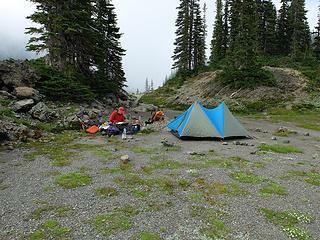 Hey All, I'm looking for great 5-6 day backpack trips. I have spent the last 50 years backpacking there and have covered most of the regularly traversed trails so I'm looking for new ones. 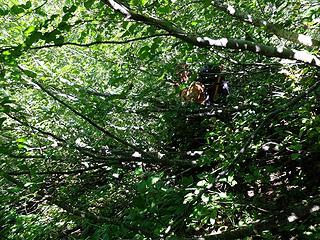 I am very capable of doing off trail or way trail trips, but not mountain climbing. Please share your ideas. Thanks. One of the great ones I see missing from your trip reports is Deception Basin? 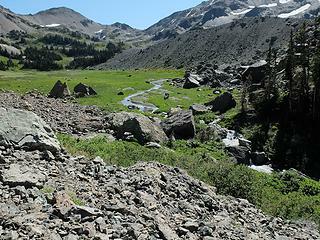 We went in via Heather Creek and Fricaba Basin. 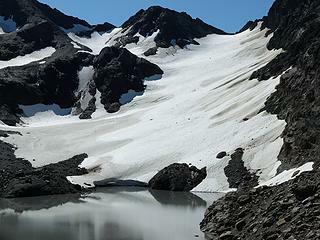 But, the ezier approach is from upper Royal Basin over Deception Paa, or a much more demanding from Delmonte Ridge and Gunsight Pass, or even up Milk Creek, and maybe even up Deception Creek past the falls into lower Deception Basin. Hey Silence, Great to hear from you again. Yes, great ideas. 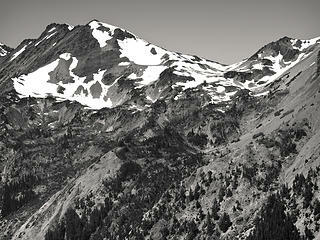 Some friends of mine went up Heather Creek Trail last weekend into deep snow. I have seen where some people head up heather Creek above the falls and turn NW heading right up toward Mt Fricaba and then over to Deception Basin between Fricaba and Hal Foss Peak. There is a lake in the basin I believe. Have you been in that area? Looks exciting to me. 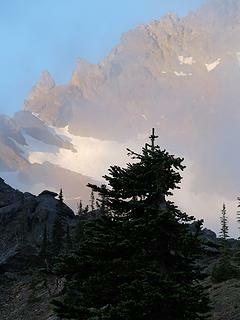 How tough a climb is it up toward the Basin from Heather Creek? Do you know if there are any trip reports? We went along Heather Creek, theb up to Fricaba Basin and over the pass between Fricaba and Hal Foss into Deception ... as have several others, including AA who inspired us to go that way. It's not ez, but is a scenic approach. See my TR, but search others as well for "Deception Basin"
There is a lake in the basin I believe. 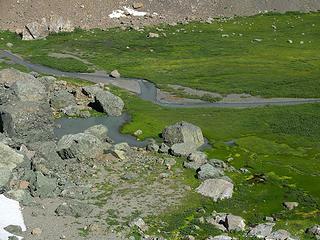 There is a lovely glacier fed lake at the base of Mt. Mystery. 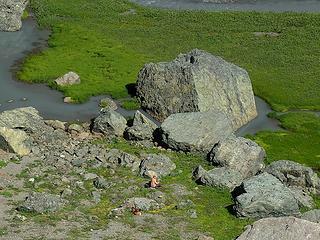 If you're talking Deception Basin ... there's a glacial lake between Mystery and Hal Foss, and a large tarn mid-basin .. see my Aug 2008 report; plus a few smaller tarns in the upper basin. Here's a pic I took in May 2015 on our way back from Del Monte Ridge near Boulder Shelter looking across at the terrain up from Heather Creek, into Fricaba Basin and beyond to the Pass before dropping into Deception Basin. A few years back Larry listed several traverses in the Olympics in this thread. It is the 4th post down and then on page 2 he lists some more. Maybe you could figure out a 5 or 6 day hike using some of them. ethorsen lists some favorite XC Hikes in this thread. some of them are in the Olympics. I found and read your TR. Beautiful report and pics. Thank you for that. I am trying to get my friend Mel to go with me. He is as you said, just a bit worried about heights. Is this really steep and "scary?" 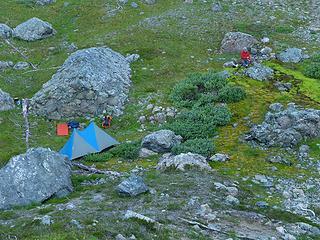 If I read your report correctly, you camped first night below the notch between Fricaba and Hal Foss Peak? 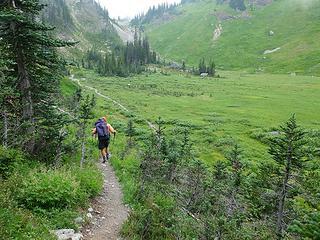 Also I have read about some people continuing over to Royal Lake and wondering about your opinion of the route down from Deception Basin to the lakes? Really tough? If reasonable for old farts like me to make up and down to the lakes to make a loop like this? Thanks restep, I'll check them out. I appreciate your help. A friend and I did the traverse from Royal Basin-->Deception Basin-->Gunsight Notch via the back side of Mystery-->DelMonte Ridge-->Sunnbrook Meadows and Constance Pass. 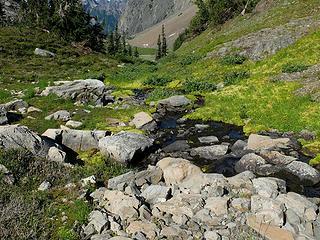 Yes, Deception Basin is beautiful--maybe one of the most beautiful spots in the Olympics. Debatable, but right up there with Cameron Basin, Martin Park, LOTA, and several others. 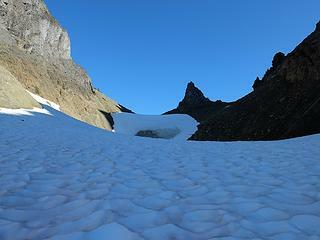 Anyway, when we were there in 2013 the glacier was receding fast. 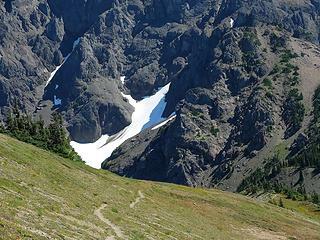 Warning, the traverse behind Mystery is an Alder-fest. 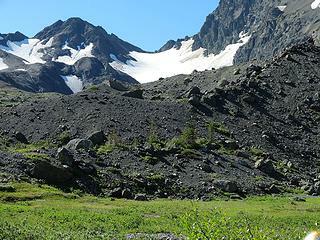 You could always drop off DelMonte Ridge into the meadows above Heather Creek and out. We were tempted to try, but I was having a rare case of boot issues. Pictures below, in order, if you're interested. NOT a 5-6 day trip as you requested--we did it in three. But I would have added a full day to explore Deception Basin and an extra day at Sunnybrook Meadows too. The route up from the basin to Deception Pass is definitely very steep (especially in the dark!). There is relatively good footing though. 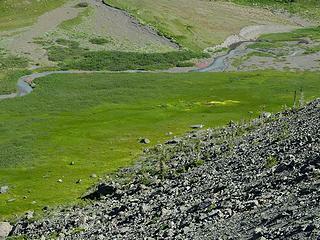 But the other side, dropping down into Royal Basin, is actually a little rougher. The slope seems a bit steeper, and a little more dicey and exposed. Hey Brian, Thanks for your ideas. I will look over your route. 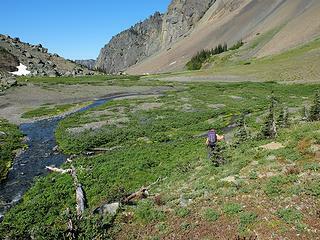 I would plan on spending a day in Deception Basin like Silence did. I absolutely love Sunnybrook meadows. 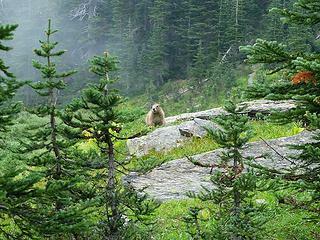 The views and meadow itself are spectacular. I also enjoyed finding the little stone shelter on top of the ridge. I would post pics here but I haven't uploaded any to a website yet. Great TR! The pics make visualizing the route so much easier The Basin looks so beautiful I just have to get there. Thanks again, Silence.